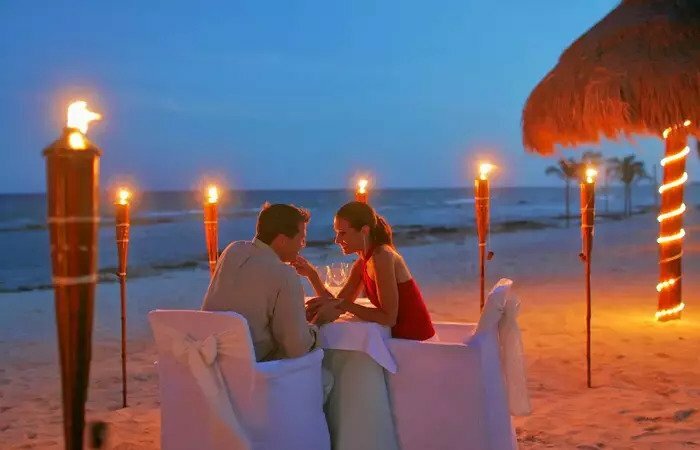 Best Honeymoon Destinations In India: With the Spring waiting for its arrival, colorful flowers in place of winter blooms, the weather becomes pleasant and the sunset becomes more beautiful than ever before, a March honeymoon in India is the perfect one for the newlyweds. Amongst the most popular destinations, this is either the beginning or the end of the peak season, which ensures less crowded, best resorts and of course the best deals. While planning your honeymoon, you have to find out a lot, with our list of the best places for a honeymoon to visit in March, we are trying to make your destination easy. Go through the list and choose your March honeymoon retreat! While you’re still trying to make up your mind about visiting the famous country’s most charming places, take a look to know what all awaits you here on your next honeymoon trip. Make sure you know it all before you go! Sikkim is one of the perfect Himalayan getaways where Tibetan and Hindu nationalities coincide like music. There are scenic temples and monasteries to explore, the beauty of nature that mesmerizes you, the culture and the adventures that attract you. With abundance to offer, it’s probably is one of the best places to visit in March for a honeymoon in India. In the month of March where you’ll see the snow vanishes off from the roads and frozen flakes on the mountains make for a wonderful view. The beginning of Spring is also perfect for a honeymoon in Sikkim as it is the perfect time to enjoy activities like trekking, river rafting, cable car ride, and mountain biking. Best honeymoon things to experience in Sikkim in March: Don’t forget to visit the glacial lake Tsomgo and other lovely places to visit in Sikkim with your beloved one, and go for a romantic stroll in Rinchenpong town. Nearest airport: From Gangtok, Pakyong Airport is the nearest airport at a distance of 32 km. Nearest railway station: There are two main railways stations in Sikkim namely, New Jalpaiguri Rail Station and Siliguri. Jaipur is all covered with intricately designed palaces, huge forts, luxurious heritage hotels, making Jaipur as one of the best honeymoon destinations in India. With Elephant Festival and Holi in the queue, there’s a lot of festive mode in March. This is the time to have the glimpse of vibrant colors of Jaipur, which becomes one of the best honeymoon destinations in India in March due to its festive spirit. The pleasant weather is like the cherry on top! Best honeymoon things to experience in Jaipur in March: Romance amid the ruins of Amer Fort at the time of sunset, enjoy a dinner date in one of the best resorts in Jaipur and hop onto the rich and spicy Rajasthani food. If you’re an adventure lover, go for a cycling tour to reach Nahargarh Fort that is one of the top places to visit in Jaipur. Nearest airport: Jaipur International Airport is one of the well-established airports in India. Nearest railway station: Jaipur Junction is the major railway station in the city. For one of the popular snowboarding and skiing destinations in India, Auli is just unmatched. 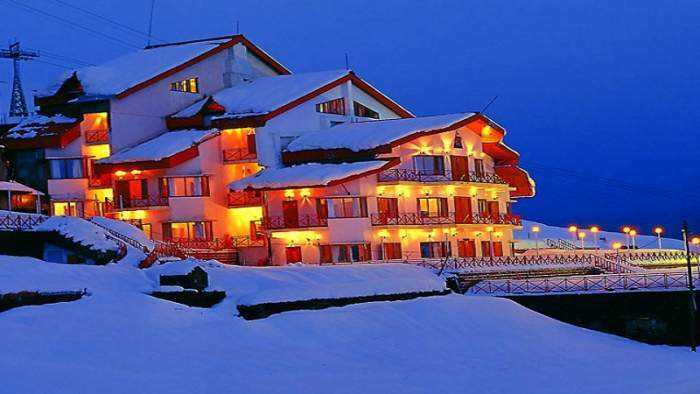 For snow enthusiasts, the best time to visit Auli is during the Winters. But March time is the best one for a romantic vacation. Amongst different honeymoon destinations in March, Auli offers one of the best snow spots along with uncrowded tourist spots. From December end to February end, Auli is crowded with tourists. It’s only the month of March when the number of tourists goes down, but the white coating of snow is still there. The beauty, privacy, and adventure of Auli offer the utmost comfort and luxury making it the perfect honeymoon destination for a March honeymoon. Best honeymoon things to experience in Auli in March: Gondola ride and skiing are must do things for couples visiting Auli. 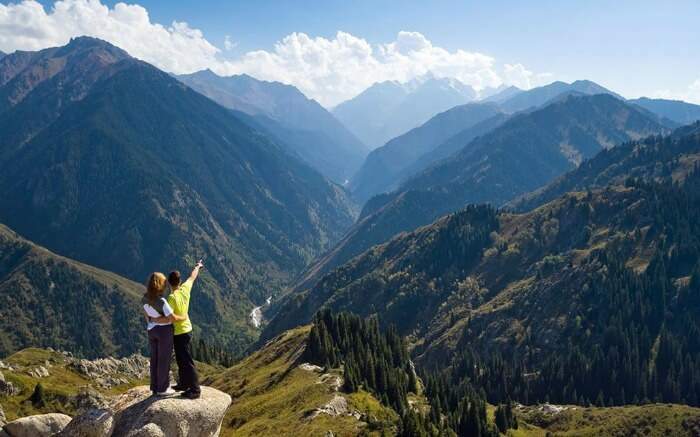 But watching the sun rise and set beyond the snow-capped peaks, especially during spring and fall, are among the most romantic things to do in any hill station – don’t miss them! Nearest airport: Located at a distance of 279 km, Jolly Grant Airport in Dehradun is the nearest airport to Auli. This one is well-connected and you can take a cab or bus to reach Auli from the airport. Nearest railway station: Haridwar Railway station is the nearest major railhead from Auli, located at a distance of 273 km. Ootacamund or Ooty is one of the most romantic honeymoon places in Tamil Nadu. The landscape looks spectacular with cloud-kissed the beautiful hills. The Botanical gardens, lakes, and tea gardens enhance the beauty of the place and especially if you’re with your loved ones. The reason it fits in the list of ‘best romantic honeymoon destinations in March 2018 in India’ is that this is the time just before tourists visit Ooty. 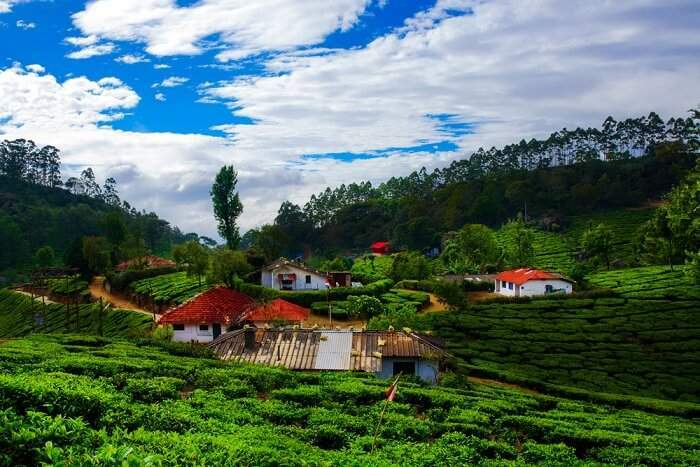 A crowded hill station, Ooty is the best visited in March when the Spring arrives and spreads greenery around and the temperature stays around 20 degrees Celsius which is the perfect time for honeymooners. 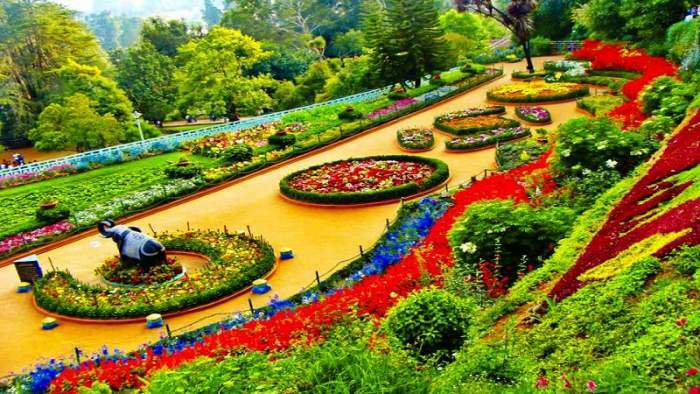 Best honeymoon things to experience in Ooty in March: Hike to Doddabetta Peak – the highest one in Nilgiri with your beloved one; enjoy boating on the glittering Ooty Lake, and have a romantic walk through the colorful botanical gardens and spice plantations. Nearest airport: At a distance of 88 kilometers from Ooty is the Coimbatore Airport and is well-connected to different cities across India. Nearest railway station: The nearest railway station from Ooty is – Mettupalayam Railway Station, from here you can take a toy train to reach Ooty. Kodaikanal is the ultimate paradise for honeymooners because of thousands of reasons. Its picturesque beauty surrounding the hills, forests, and waterfalls is just one of them. But this scenery backdrop becomes much more beautiful in the refreshing weather of March. The Queen of Hills gets packed with greenery, making the hills view absolutely stunning. In the beautiful March season, sitting by the window’s side of a lavish honeymoon resort is as romantic as it gets in the bizarre South Indian town of Kodaikanal. Best honeymoon things to experience in Kodaikanal in March: Just pour yourself in nature’s lap and go for a nature walk. If you’re a kind of little adventurous person, then you must go for horse-rides or cycling near the lake areas; Kodaikanal Lake and Berijam Lake are out-of-this-world. Or if want some relaxation, witness the gushing waterfalls like Cascade Falls and fall in love with the serenity of Kodaikanal. Nearest airport: Located at a distance of 120 km, Madurai is the nearest airport from Kodaikanal. Coimbatore Airport and Trichy Airport are other nearby options at a respective distance of 150 km and 175 km. Nearest railway station: Kodaikanal has the railway station on the name of its own, called Kodaikanal Road railway station. This is well-connected and getting taxis and buses here is pretty much easy. 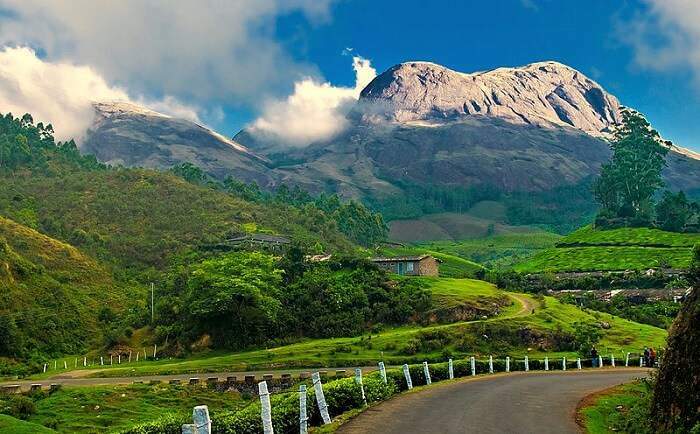 Excluding Kerala, Munnar is one of the best honeymoon destinations in South India. Famous for spices and tea gardens, this is one of the most beautiful places where you can plan your honeymoon. March is not a peak tourist season for Munnar, so the crowd is going to be less in numbers and managing a good accommodation will be very easy. Apart from this, it is before the arrival of summer in Kerala, the weather is also good. Choose from the best romantic resorts in Munnar, plan a travel program with experts and celebrate a memorable March honeymoon in Munnar. This is the best place to visit in March for a honeymoon in India, as this month imprints the beginning of summer, the weather stays pleasant. Best honeymoon experiences in Munnar in March: Have a lazy walk in the tea gardens of Munnar, go for a romantic boat ride on Kundala Lake, enjoy sightseeing of the top places to visit in Munnar, climb to the Anamudi Peak that is the highest peak of Western Ghats, and relive your childhood dreams of staying in a tree house. Nearest airport: Located just 110 kilometers away from Munnar, Cochin International Airport is the prime airport in India. Nearest railway station: At the distance of 110 and 130 kilometers respectively, Aluva and Ernakulam Railway Station are two railway stations near Munnar. Daman and Diu are one of the less popular honeymoon destinations in India in March. In the former Portuguese colony, there are some tranquil beaches that give great sunsets and relaxing options. Soft sand, coconut canopies, magnificent fortresses, and delectable churches define Diu. And the lovely movement of sea waves in the month of March is such that they lead towards the creation of unique beaches in low tides. In addition, near the peak season, you can expect hotel rents to be a little less. This is definitely one of the best honeymoon destinations in India in March 2019! Best honeymoon things to experience in Daman and Diu in March: Enjoy beach hopping and see beaches like Jampore Beach & Nagao Beach; watch the stunning sunset, and go deep inside the history as you go on a heritage tour visiting St. Paul’s Church & Diu Fort among others. Nearest airport: Diu has its individual airport connected to Indian metropolitan cities like Mumbai via Jet Airways flights. Nearest railway station: Located 12 km away from Daman and Diu, you’ll find Vapi Railway Station. For an ideal honeymoon in March, there is no better place than the most beautiful and peaceful island in Andaman Island. Havelock is heaven for newlyweds who are looking for an ultimate getaway. Being home to the popular Radhanagar beach, there are so many sweet experiences in the store on this island. During the month of March, the temperature is mostly below 20 degrees and the island is surrounded with cool breezes throughout the day. And the magnificent villas and tranquil resorts near the beach makes the romantic holiday more memorable here. Best honeymoon things to experience in Havelock in March: Going for a romantic stroll by the famous Radhanagar Beach is undoubtedly the must-do thing for couples honeymooning in Havelock. Other than snorkeling, kayaking, and having a beachside candlelight dinner are a few other top things to do here. Nearest airport: In Port Blair, Veer Savarkar International Airport is a major airport in India, with well-connected flights worldwide. Nearest railway station: Since this is an island, there is no railway connectivity here. Amongst the honeymoon destinations in India in March, if there is one place which is both cool and calm and that too in the desert area, then it’s the gorgeous Mount Abu. Mount Abu is the only hill station in Rajasthan as this destination offers a great experience like no other place can for the couples celebrating their new journey! Not only the scenic views of the surroundings, but also this place is home to attractions such as Dilwara Jain temples, which were built almost a thousand years ago, the famous Nakki Lake, and more which gives this ancient city a finishing touch to its admiring beauty. Best honeymoon things to experience in Mount Abu in March: Go for boating at the beautiful Nakki Lake, visiting the magnificent Dilwara Temples, and wondering the unmatched beauty of nature together from the peak of Toad Rock are few of the best things to do here. Nearest airport: At a distance of 210 km, Udaipur Airport is the nearest airport from Mount Abu. There are flights that connect the airport with several cities across the country. Nearest railway station: Mount Abu has his own railway head, named Abu Road Railway Station. It is a well-connected one. While many people might argue that, Goa is not one of the best honeymoon destinations in India, we would say that it certainly is. This is the month after February, when this beach city witness the vanishing of all the tourist crowd, offer a good price drop in most hotels and become an ideal place to experience luxury and peace. Newlyweds can be assured of the weather here as isn’t too hot or humid during March, and look forward to the beach tan and romantic time with ultimate joy. And with so many attractions and activities, there is still a lot to see regarding the charm of Goa. Best honeymoon things to experience in Goa in March: Become a part of the Shigmo Festival, which is the city’s way to celebrate Holi, stay at a lavish hotel or take a homestay with a beach view, go for lazy, calm beach walks, and enjoy delicious seafood.